Affiliate marketing is a type of performance-based marketing in which a business rewards one or more affiliates for each visitor or customer brought by the affiliate’s own marketing efforts. The industry has four core players: the merchant (also known as ‘retailer’ or ‘brand’), the network(that contains offers for the affiliate to choose from and also takes care of the payments), the publisher (also known as ‘the affiliate’), and the customer. The market has grown in complexity, resulting in the emergence of a secondary tier of players, including affiliate management agencies, super-affiliates and specialized third party vendors. Agency: As in traditional marketing, there are Affiliate Marketing agencies such as Gen 3 Marketing, Affiliate Traction, or OPM Pros. They are traditional services organizations that perform a wide range of tasks, including: affiliate recruitment & relationship management, concept & design of advertising creatives, or promotion distribution. Vendor: A catch-all term for 3rd-party product or services to the affiliate industry, such as data feed transformations, analytics, or Email marketing. A few examples include: GoldenCAN, Mercent, Google Analytics, or Omniture. Network: The Middleman. 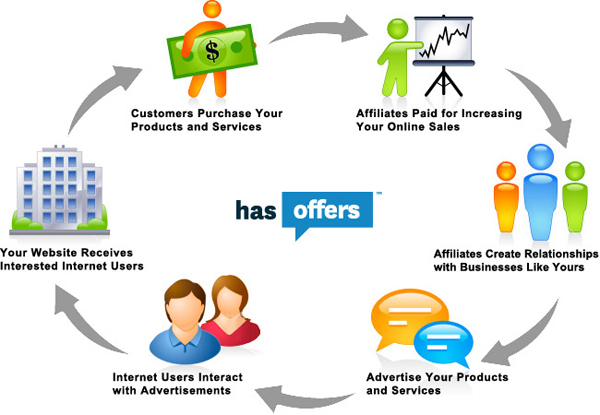 Affiliate networks provide both the technical infrastructure and the business logistics for affiliate marketing to operate. Responsibilities include: 1) running and maintaining the tracking software that credits referrals from affiliates for actions, 2) recruitment for both merchants and affiliates, and 3) handling all of the financial details (tax forms & payments for affiliates and merchants). Some examples include: Commission Junction, LinkShare, PepperJam, Affiliate Window, ShareASale, or ClixGalore. Now that we’ve covered the ecosystem participants, here’s a simple explanation of the economics behind each member. Merchant: The merchant either buys or produces for $X dollars a product or service, and then sells it to the Customer for $Y dollars. (Whether on an individual sale, or lifetime expected Gross Receipts/Gross Cost of Goods Sold basis for a customer). The difference between the revenue ($Y) and the costs ($X) is the Gross Profit. Subtract out the Cost of Customer Acquisition (the associated affiliate commissions), and you’re left with the Net Profit, which is what the Merchant ultimately makes, even if that’s a negative number. Marketplaces: Amazon, eBay, Buy.com, and Sears all operate “marketplaces”, where multiple Merchants can upload a list of products available to sell & ship. At these Marketplaces, the Customer interacts directly with the Marketplace (Amazon/eBay/etc) to find their product, make their purchase, and process payment. Nearly all customer contact details/payment information/purchase history/etc remains with the Marketplace, and all future communication with Customers is limited to the transaction details. In this scenario, the Merchant, for all intents and purposes, is more similar to drop shipper than an store or seller, profitability is simply calculated by revenue received from the marketplace minus your costs of fulfillment. eCommerce Stores: This is your traditional branded eCommerce store & shopping cart software. Customers navigate directly to the Merchant website, find products, create an account, make a purchase, and the Merchant processes the order. One distinct difference between the Marketplace model and this one, is the customer BELONGS to the Merchant. The Merchant is responsible for the entire shopping experience, and usually has the opportunity to market (eMail, phone, snail-mail, etc) to the Customer in the future. If acquiring Customers through Affiliate Marketing, the initial cost is often referred to as a Cost of Customer Acquisition, since unlike the Marketplace model, Merchants have the opportunity for future marketing interactions and generating repeat orders without the initial Cost of Customer Acquisition. Agency: Generally, most traditional Marketing Agencies charge clients a % of marketing spend. In keeping with tradition, so do most Affiliate Marketing Agencies. For example, if an affiliate marketing program generates $10k in affiliate commissions, a 5% agency fee to the Merchant is $500. Agencies also have monthly minimums that may be higher than the service fee %. Vendor: Most often vendors will charge the Merchant either a flat rate for a service ($5k/month) or a variable based upon the actual usage (e.g. $5/per feed). They also may have a monthly minimum. Network: Here’s where it gets tricky. Minimum Deposit Amount: Generally, the Merchant’s account with the network acts similar to a Debit Card/Checking account. There is usually an account minimum deposit such that a Merchant pre-pays commissions to the Network, from to which the Network deducts affiliate commissions. This minimum deposit generally ranges from $0 to $2k. Transaction fees/Override Amount: This is the true revenue stream for most Networks. Often called a Transaction Fee or Override Amount, these fees are typically a percent of Affiliate Commissions charged to the Merchant for use of the Network services. This fee is generally between 20%-30% of Affiliate Commission. For example, assume that the Affiliate Commission is 10% and the Override Amount is 20%. With a Sales Amount is $100, the Commission payout is $10 to the Affiliate and the network would charge 20% of the $10, or $2 for the Override Amount, with total charge of $12 to the Merchant. License Fee/Monthly Charge: Some networks charge an additional fee for the ongoing tools and customer support burden. One network described their License Fee as: “This monthly cost enables access to all the contact tools, tracking, account support services, real-time sales reports, invoicing & payment services and technical support.” Generally this is between $0 and $500/month. Monthly Minimum: There is, commonly, a monthly minimum for the Transaction fees/Override Amount. For Example, If the Transaction fees are 20% and there was $10k of gross sales generated, with a 10% affiliate commission, the amount due to the Affiliate Network would be $200 ($10k gross sales * 10% affiliate commission * 20% network transaction fees = $200). If the Monthly minimum is $250, then the greater of the two (calculated $200 vs minimum $250 is charged). Generally this amount ranges from $0 – $500 depending on the network. Affiliate: The affiliate or publisher earns the Cost Per Action or Commission as defined by the Merchant affiliate agreement. This is often a percent of the commission sale, % of reoccurring subscription revenue, or a flat amount per signup, form completion, or order. Customer: Again, the customer is ultimately looking for the Merchant’s product or service, and the Affiliate finds the customer and refers them to the Merchant, where they make a purchase and the Affiliate gets compensated for the referral. After understanding the aspects of how all of the business relationships work, the next step is to understand the mechanics of the implementations. There are two basic implementations, one involves Cookies and the other involves back-end API development. For the purpose of simplicity, I’ll just cover how the Cookie Based approach works, which is also the most common. The Affiliate Network will generate a unique URL for each Affiliate for each and every Merchant. In an example Commission Junction link: http://www.tkqlhce.com/click-3576795-10746577 the 3576795 represents the Affiliate, and the 10746577 represents both the Merchant and a specific advertising campaign the is being run. A Customer will click/navigate to that URL and have a Cookie set saying the Affiliate 3576795 referred that customer to the Merchant. The AdId (10746577) is also associated with a destination page (in this case http://shop.advanceautoparts.com/webapp/wcs/stores/servlet/home) to which the customer is redirected to. The customer performs product searches, adds an item to the Shopping Cart, and continues to check out. On the “Thank You” page, the Merchant has a pre-installed 1×1 transparent gif (to the network) that has an URL parameter such as productSales=100.00 that the Affiliate Network then uses to decide between whether 1) the purchase was made by a referral from a pre-existing Cookie for Affiliate 3576795 and then credits the account for the commission, or 2) doesn’t see a cookie and ignores the purchase. Author Note: I consider this post a draft, and will need to add a lot more for it to be anywhere near comprehensive. 5/6 Edit: Some verbiage updates & inclusion of Marketplace vs eCommerce Store economics.